My psychiatrist has a life-sized stuffed tiger in his waiting room. At the big cat's feet is a plastic bin serving up a mangled heap of smaller stuffed animals -- parrot, cat, whale, unicorn -- and plastic babies missing a limb or an eye. Freud was the first to have a therapy dog. His red chow, Jofi, would lie on the couch next to patients, and when the dog got up to scratch at the door for a pee, Freud would say to his patient, "You see, Jofi is so excited that you've been able to discover the source of your anxiety!" But a therapy tiger? Before my daughter knew the crisscrossed scars on my arm were self-inflicted, she used to call them my "tiger stripes," and she was amazed that I had survived such claws. This tiger, too, comes with a warning. 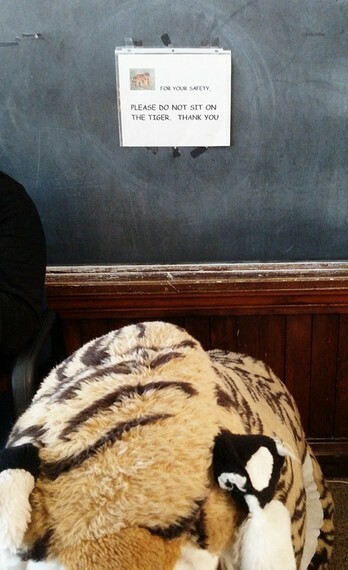 Taped to the wall is this notice: For Your Safety Please Do Not Sit on the Tiger. I think about this posted warning. Is it a test? Does my doctor really want me to sit on the tiger? What are my unconscious motivations for wanting to sit on the tiger? What neuroses keeps me from sitting on the tiger? And really, safety's sake aside, I'm supposed to take risks. So, reverse psychology? Or does he want me to make associations? As in, "Eye of the Tiger" -- "Went the distance, now I'm back on my feet, Just a man and his will to survive..."
Another patient sits across from me, beside the tiger, nervously flipping through the pages of a kids' Highlights magazine. Maybe he's searching for cups and candles and lamps in the Search and Find picture. His knee jiggles. Anxiety? Hypomania? Low-flying schizophrenia? He doesn't even look at me when I walk over, inches from his bouncy leg, to take a picture of the tiger as if I'm on some psychiatric safari. I sit back down and glance down at my tiger stripes. The last time I did anything like that was five years ago, which was also the last day I drank. What I remember from that day: arriving at my friend's baby shower, a blue ribboned gift in hand (cheerful whale stitched onto a matching bib, socks, and onesie), desperately sad because my life had unraveled. Bipolar, anorexic, alcoholic. The perfect, decimating storm. A surge of longing when I gazed at my friend's moon belly. Always, I had imagined my future with three children. Oldest, middle, youngest -- a noisy triumvirate. And I would be the kind of mother capable of holding all that needy, exhausting love. But after the birth of my second child, my bipolar disorder escalated and my doctors said "no" to my irrational contemplation of a third, and my husband, who bore the brunt of my breakdown, adamantly refused. Too risky, too much, too sick. Besides, I hadn't needed a tampon for two years -- starvation accompanied by over-exercise had turned off the fertility switch. But baby hunger was all I could think about while playing the chocolate-smeared-on-a-diaper game. No more crazy Momma. Just my composed self rocking a warm baby, my lips against the heart-fueled pulse at the fontanel. What I last remember: standing alone in the kitchen, laughter pealing in from the living room, an island crowded with wine bottles. I had promised my husband I wouldn't drink since I could no longer control how much or what would happen when I did. But that magnum of acrid cabernet promise? I could blot myself out, find my funny again, instead of sitting on the couch full of nervousness, envy, and loneliness. A glass or two of wine would shake me loose. I filled a plastic cup and drank it down in one swallow. Then another, quickly, desperately. How many could I drink before someone came into the kitchen and caught me? Six, seven, the whole bottle? 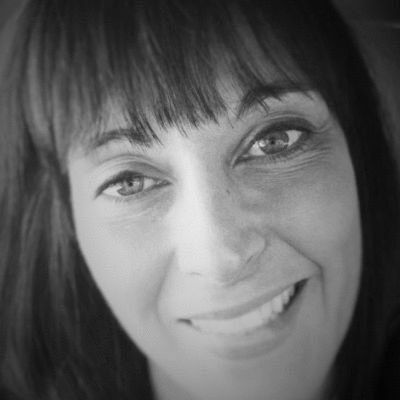 What I next remember: waking in the hospital, cuts up and down my arms, and my husband standing in the corner of the room, his lips pressed together, no longer worried and forgiving, but hard and immobile. My kids were nowhere. That is, they were stashed somewhere safe because I was unsafe. "I'm sorry," I said, again, adding to my long recitation of sorry's over the years. "Do you know why you're here?" he asked. He hadn't accepted my apology. "There was the shower and I drank." Nothing else after, just an empty, black hole that I didn't know how to fill. "After you guzzled wine, you ran outside into the snow and cold without your shoes or coat and wouldn't come back. Your friends called me, so I could come get you. When I found you out by your car, you insisted you were going to drive off and kill yourself. You meant it. I got you home, but then you did that to your arms. Your doctor said you needed to be admitted." I can do this better, I thought. I can do this over. I can stop and be well. My husband didn't move toward the bed, but was rigid with fury and resolve. Couldn't he remember that he had promised to love me, in sickness and in health? Couldn't he give me another chance, and another chance, and a chance after that? But I knew there would be no talking myself out of this, as I had before: I promise, I promise, I won't drink so much. I'll count my drinks. I'll pay attention. "I won't do this anymore," he said. "If you don't stop drinking, you lose the kids and me. It's your choice but this is it." The room fell away. Lose them? They were the only reason I was alive. And my husband marooning me with self-loathing and despair? My daughter once drew a picture for me when I was in the hospital during one of my manic episodes: an enormous green and black winged creature with the words, "Momma Come Home!" It was fierce and fiery, born of courage and will. She was calling me to that again. "Yes," I said. There was no alternative, not anymore. I had to go home, whatever it took. In the almost five years since that moment, I got sober and stable and ironically, divorced. The marriage couldn't ultimately survive the turmoil of my illness or the betrayal of his affair. For much of my life I said "No" -- to love, grace, and assistance. I would go it alone, never mind if I could. Now, "yes" is reflexive. Can I love myself? Yes. Am I a good enough, at times even better, mother? Yes. Do I have the courage to live an authentic life, in truth and forgiveness? Yes. Am I afraid, legs wobbling, in this new life of mine? Yes, but the trajectory from that lonely woman, cut up and starving and hung-over, to the woman writing this without shame and with a belief that the universe is saying "Yes" back to me? I don't sit on tigers anymore, but I am not risk averse. I risk integrity and truth now, and push my sleeves back, revealing my scars, my tiger stripes, and maybe even risk your seeing all that pain and healing.